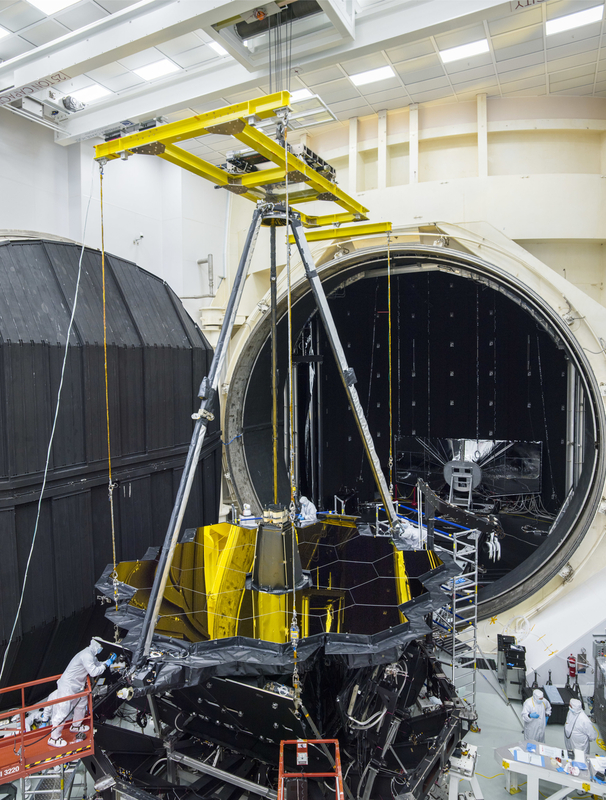 NASA's Johnson Space Center's "Chamber A" in Houston is an enormous thermal vacuum testing chamber and now appears to be opening its "mouth" to take in the James Webb Space Telescope for testing. The telescope and the Integrated Science Instrument Module (ISIM) are two of the three major elements that comprise the JWST Observatory flight system. They are shown here being lifted onto the test stand prior to being placed in the chamber. The other is the Spacecraft Element (spacecraft bus and sunshield), which is currently under construction at Northrop Grumman Aerospace Systems (NGAS) in Redondo Beach, California. The James Webb Space Telescope is the scientific successor to the NASA/ESA Hubble Space Telescope. It will be the most powerful space telescope ever built. JWST is an international project led by NASA with its partners, ESA and the Canadian Space Agency.